Great Location offering 2 Queen Rms/ 2 ensuites right in town. Other cottages include Pickett Cottage and Kelly House. All up "Kelly & Wright Luxury Accommodation" will accommodate up to 20+ guests. (Further accommodation is also available at "Beeches on High" which sleeps 12). 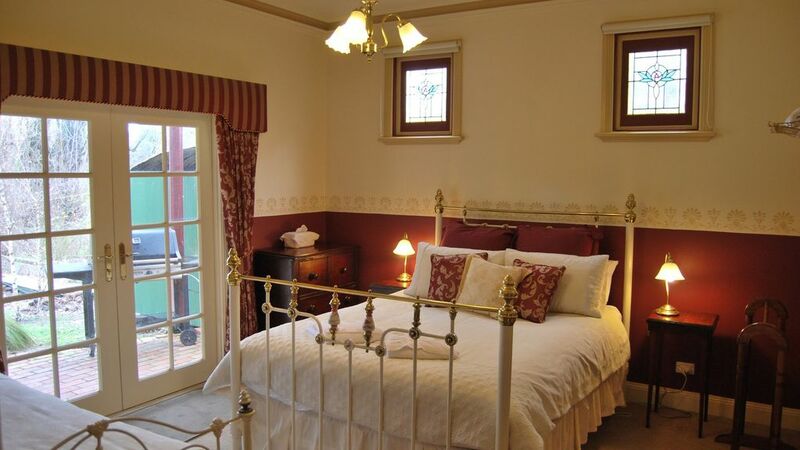 It offers 2 large luxury Queen bedrooms both with ensuites. Both of the two bedrooms have a Queen and a single bed (with one being a 3/4 single) .The larger of the 2 ensuites serves also as a shared ensuite to the sofa bed for an additional 2 guests. Sleeps in Total 8. Midweek Discounts apply upon request (Sun- Thurs) N/A Public & School Holidays. Ensuite Includes Sep Shower, Toilet and basin. Ensuite incl large spa bath, sep shower ,basin & sep toilet. Nice place. Unfortunately we only stayed overnight. It was in a perfect position to walk to the town. The facilties, such as the open fire, spa, kitchen and bedrooms made it very comfortable stay. Beechworth allowed a relaxing holiday for teenage girls and their parents. Wright House offers a great place for guests to wind down and relax. It is located right in town yet very private overlooking the Spring Creek reserve. It offers Wifi and Netflix.